Cooling towers are an integral component of many refrigeration systems, providing comfort cooling or process cooling across a broad range of applications. They are the point in the system where heat is dissipated to the atmosphere through the evaporation process, and are common in many industrial applications where process cooling is required. They are also commonly used to provide comfort cooling for large commercial buildings. Cooling capacity, the amount of heat that can be rejected from the water to the air, is directly tied to the relative humidity of the air. Air with a lower relative humidity has a greater ability to absorb water through evaporation than air with a higher relative humidity, simply because there is less water in the air. 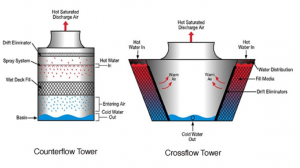 Cooling towers are the primary component used to exhaust heat in open recirculating cooling systems. They are designed to maximize air and water contact to provide as much evaporation as possible. This is accomplished by maximizing the surface area of the water as it flows over and down through the tower structure. In a cooling tower, the water is distributed evenly across the top of the cooling tower structure. The distribution deck or spray nozzles must uniformly apportion the recirculating water across the tower structure. Broken nozzles or plugged orifices will impede uniform distribution across the tower structure, negatively impacting the overall heat exchange capacity of the system. As the water falls from the distribution deck, the surface area is further expanded in the cooling tower fill section. Tower systems may feature splash bars made of plastic, fiberglass, or wood that serve to break the falling water into tiny droplets. In recent years, many different forms of labyrinth- like packing or film fill have been incorporated. The closely packed nature of film fill causes the water to travel through this portion of the tower in thin streams, improving thermal efficiency and the evaporation rate, thereby increasing heat rejection. One of the functions of the water treatment program is to keep the cooling tower free from scale and corrosion.